Why KI? Part III. Potassium Iodide, Iodine, The Stomach and The Prostate. In Part II we considered the evidence for which form of iodine the mammary glands prefer. In this section we will look at the stomach and the prostate, the other two parts of the body which it has been argued requires the I2 form of iodine. KI or I- is a form of iodine that is not only readily absorbed the stomach but also concentrated there as well. I2 needs to first be reduced to I- before absorption. The I- concentrating mechanisms in the mucous membrane layer of the stomach have been known for some time.23 I- concentrating cells include gastric, small, and large intestinal mucosa.24,25 Ingested iodine in the form of water-soluble salts such as KI usually results in 100% absorption from the gastrointestinal tract. I2 is reduced to I- in the gut and almost completely absorbed by the small intestine.26 How then can we suggest that the stomach prefers I2? The stomach uses I- in a way that protects cells. “The stomach, breast and thyroid share an important iodide-concentrating ability and an efficient peroxidase activity which transfers electrons from iodides to the oxygen of hydrogen peroxide and so protects the cells from damage caused by lipid peroxidation.”27 Supplementing with KI will also have an antioxidant effects in the body. We are talking about supplementing with iodine by ingesting I- in order to make it available for the entire body. For this to happen the stomach has to be able to absorb I-, which it does. It is the gateway for the iodine delivery system. Most of the body uses I-. How does the stomach prefer I2 when it is the first step in the delivery of I- to the rest of the body? Once again we refer to the 2 week rat study. This two week study of rats stated that the thyroid gland and skin tissue contained more iodine when given KI whereas the stomach lining contained more iodine when given I2.28 This suggests that the rats were better at taking up the KI. Remember that preference is given to the thyroid over the rest of the body, as it is the primary user of iodine. There may be a complete hierarchy of iodine preference in the body. If so, and since we do not yet know this hierarchy, then it must first be established that the entire body’s iodine demands are completely satisfied. This will take longer than two weeks. Then we can consider the relative amounts of iodine taken up by different parts of the body. This point was never addressed. Also, if I2 is being ingested and it remains in the stomach then perhaps some of the I2, that wasn’t converted to I-, is not making its way throughout the body and being made available for the various tissues and cells. This suggests partial failure in the process of iodine supplementation because the I2 form was used. It has been said that this study raised the question of whether or not different tissues in the body require different forms of iodine. While we maintain that different forms are not required, we believe questions of this nature are important and there is a need for more research. Advocates of the opposing view do not actually answered the question. Instead some have jumped to the conclusion that the body needs both. The popular response has been to keep repeating that the body needs both. It has become like a mantra in the iodine-taking community. Here the fifth principle for considering evidence comes into play. It is questionable to go from finding high amounts of iodine in the stomach lining of rats to raising the question about the preference tissues. However, the real concern with this reasoning is the jump from raising a question to concluding that the stomach tissues, in rats, and by extension humans, needs I2. We do not see any evidence supporting this. What if someone pointed to the fact that bromide competes with iodine in the body and binds to the same receptors? Would they then conclude that the body needs more bromine? Or that the body can use bromine as a replacement in the absence of iodine? Or that there is a preference for bromine? Those who accept that the stomach needs I2 will also be careful not to take Vitamin C with the I2 because it will be reduced to iodide. There is no evidence of the Japanese being careful to avoid taking any form of Vitamin C when they are also having seafood and sea vegetables. If so it would have been clearly referenced in books about iodine. We have not found evidence of this but would be very interested to know if anyone else has. We do not believe the Japanese avoided taking Vitamin C along with their iodine rich diets. We see this practice as a recent innovation. Vitamin C is incredibly important to take in large amounts, and on a regular basis. The evidence shows that the stomach utilizes I-. It is well absorbed in the gastrointestinal tract and also has powerful antioxidant properties. The argument, and you would be generous to call it that, for the stomach having preference for I2 is not a strong one. While in some minds it may raise a question on the form preferred, evidence and/or reasoning still needs to be provided to reach any conclusions. The prostate has sodium-iodide symporters (NIS) for the purpose of taking up I- into the cells. This indicates that the prostate uses I-. No argument is really given for the preference of I2 by the prostate. The connection to the Japanese diet is often made however when you consider that this diet contains high amounts of I-, and not I2, it should be clear that I- is the preferred form. We explore this in more detail in the Iodine and Iodides in Seaweeds and Supplements post. The Japanese diet contains high amounts of I-. 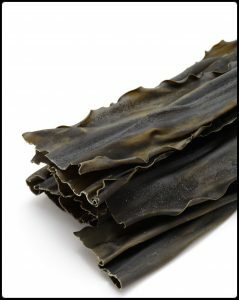 It is ingested by from eating seaweed which mostly provides iodine in the form of I-.29 Kombu, also called “The King Of Seaweed”, is known for being rich in minerals and holding high amounts of iodine. A study has shown that the body absorbs more iodine when supplemented with KI when compared to powdered kombu.30 Here we see more clear evidence that the body prefers I- or KI. Both normal and cancer cells depend on NIS for the uptake of I-.32 In one study, NIS was found in 52% of prostate tumors and was associated with more aggressive tumors.33 It may be that not enough I- was making it to the prostate. Perhaps the NIS was not functioning properly. I- is used by the prostate and positively affects its overall health. Perchlorate, which includes chlorine, is a goitrogen that has become more common in the modern environment. Our water supply is sometimes contaminated with it and has also been making its way into crops and livestock. It can displace iodine binding in the body. It can also impair the NIS function throughout the body. This would severely limit the uptake of I- in the prostate. Men diagnosed with prostate cancer should work on repairing the NIS34 by regularly taking high amounts of Vitamin C and incorporating natural salts, such as Himalayan Rock Salt, into their diet. Taking sufficient amounts of KI will help protect the body from the effects of perchlorate. With attention also given to NIS repair, the prostate should begin reverting back to its healthy state before it became iodine deficient. The evidence shows that the prostate uses I-. As with the mammary glands, we must consider if the thyroid getting enough iodine and that there is enough available for the rest of the body. We must also ensure that the prostate NIS are functioning. Beyond these potential issues, KI will provide the prostate with the iodine that it needs. The breasts, stomach and prostate all take up and use I- or KI. There is strong evidence that supports this position. The arguments and evidence presented for using Lugol’s form is not as strong. It is important to remember that the 12.5 mg estimate for daily maintenance amount of iodine was based on the consumption of seaweed in Japan. Seaweed contains mostly the I- form of iodine.35 The 12.5 mg estimate was confirmed by testing the amount of I- excreted in the urine at different dosage levels. It should be noted that we cannot test for I2 levels in blood serum or urine. We only test for I- levels. The tests indicated that approximately 12.5 mg is the amount we should be taking for maintenance on a daily basis. Beyond that the body begins to rapidly expel the excess I-. Given these facts, we maintain that a safe maintenance amount of iodine is 12.5 mg and that it should taken orally in an I- form such as KI. In Part IV we will discuss why Lugol’s is also effective and why both forms are the right answer. We will then identify and discuss what some poor answers are to regarding iodine supplementation. 23) Brown-Gant, K. (1957). The Iodide Concentrating Mechanisms of The Mammary Gland. The Journal of Physiology, 135(3), 644-645. 24) Spitzweg, C., Joba, W., Schriever, K., Goellner, J.R., Morris, J.C., Heufelder, A.E. (1999). Analysis of human sodium iodide symporter immunoreactivity in human exocrine glands. The Journal of Clinical Endocrinology and Metabolism, 84(11), 4178-84. doi:10.1210/jcem.84.11.6117. 25) Carrasco, N. (2013). Thyroid Hormone Synthesis. In L.E. Braverman and D.S. Cooper (Eds. ), Werner & Ingbar’s The Thyroid (pp. 32-45). Philadelphia, PA: Lippincott Williams & Wilkins. 27) Venturi S., Donati, F., Venturi, M., Venturi, A., Grossi, L., Guidi, A. (2000). Role of iodine in evolution and carcinogenesis of thyroid, breast and stomach. Advances in Clinical Pathology, 4(1), 11-7. 28) Thrall, K.D., Bull, R.J. (1990). Differences in the distribution of iodine and iodide in the Sprague-Dawley rat. Fundamental and Applied Toxicology, 15(1), 75-81. 29) Shaw. T.I. (1959). The mechanism of iodide accumulation by the brown sea weed Laminaria digitata. Proceedings of the Royal Society of London, 150(940), 356-371. 34) More information is available in our guide to supplementing with iodine. 35) Shaw. T.I. (1959). The mechanism of iodide accumulation by the brown sea weed Laminaria digitata. Proceedings of the Royal Society of London, 150(940), 356-371. Subscribe to our mailing list for updates on this article and notifications about new posts and promotions.